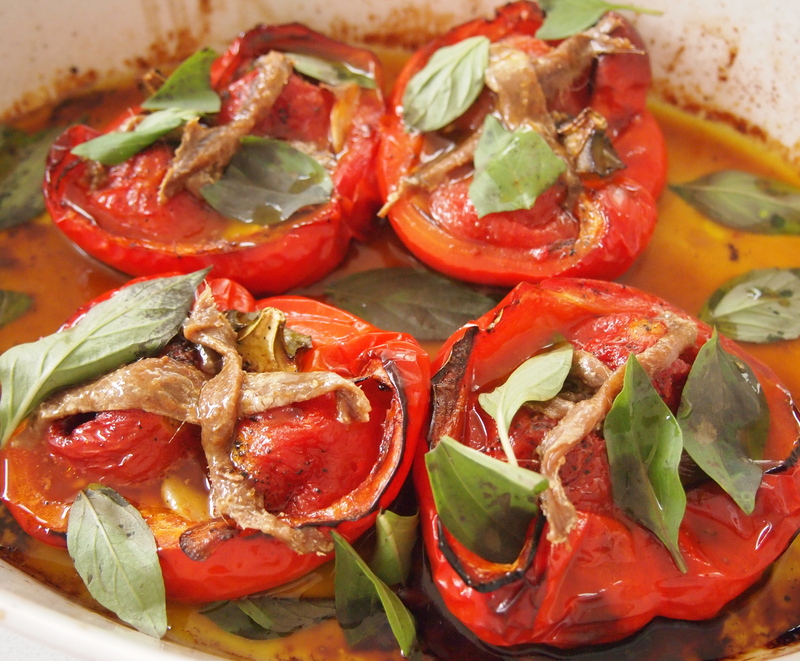 This recipe by Simon Hopkinson, sometimes referred to as Piedmontese Peppers, has been around for a very long time. Delia Smith even featured it in her hugely successful Summer Collection cook book published back in 1993. Somehow though the recipe never really grabbed me until I saw Simon Hopkinson make it on his recent TV series The Good Cook and I knew I had to make it fast. I’m so glad I did and yet so upset that I’ve missed out on cooking and eating this for all these years! I say missed out on cooking it because it’s one of those dishes that for some undefinable reason is actually very soothing and therapeutic to cook. Maybe it’s that whole European thing of taking a handful of the freshest in-season ingredients and turning them into something so much greater than the sum of their parts. This is amazing served on it’s own with some crusty bread for lunch or a light supper. It’s also great as a side dish to some roasted or grilled meats. I cooked the recipe below for the two of us and had half the peppers left over so a few nights later I sliced them up and turned it into one of the best pasta dishes we’ve had in a very long time. There are two stipulations I would recommend for this dish; use the very best olive oil and anchovies you can afford. And please don’t skip the anchovies. Even if you’re not a fan just try them in this recipe but only try them if they are excellent quality. i.e. not the ones that are sold in glass jars. They’re fine for cooking but this requires something a little more special so Ortiz anchovies would be excellent or I’ve recently found a brand called Rizzoli which are just about as good and slightly less expensive. Preheat oven to 190C. Pour boiling water over the tomatoes, leave for 15 seconds, carefully remove from the water and peel off the tomato skins. 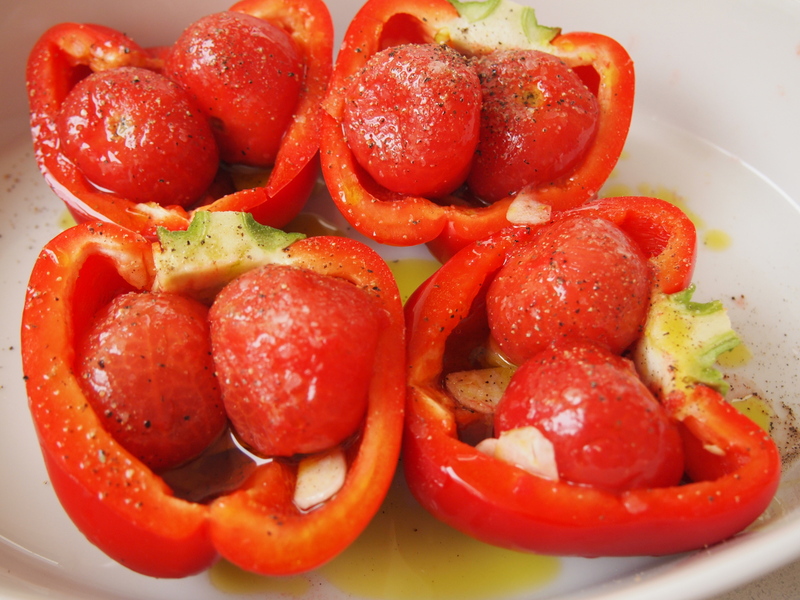 Place the halved peppers into an ovenproof dish, cut-side up. Place the garlic inside the peppers and then fit the tomatoes inside too, pushing them gently into the space. Add a good pinch of salt and a grinding of freshly ground black pepper. Spoon over the olive oil and then place into the oven. The recipe calls for 5-6 tablespoons but really you can’t go wrong with adding a bit more. Bake for about 45 minutes to one hour, turning the heat down a little if you notice any excessive scorching of the peppers. 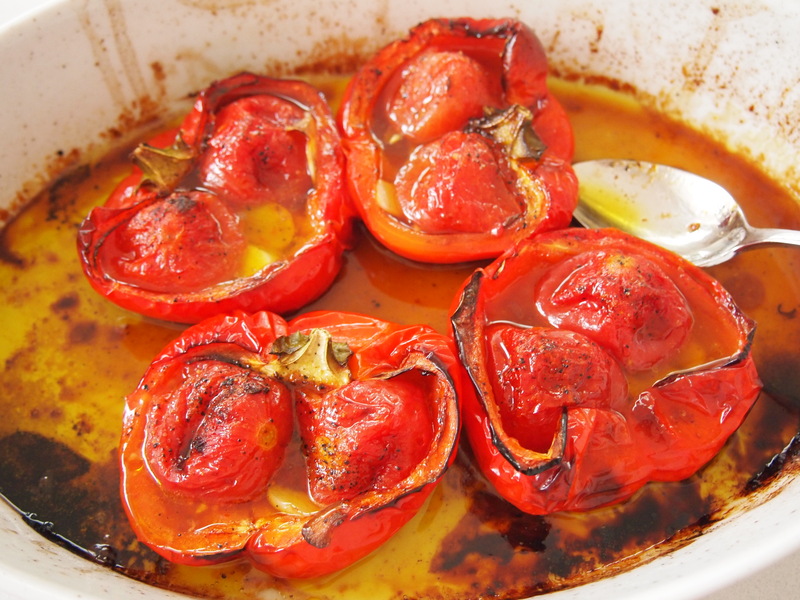 Once they are nicely softened and have slightly collapsed, remove the peppers from the oven. 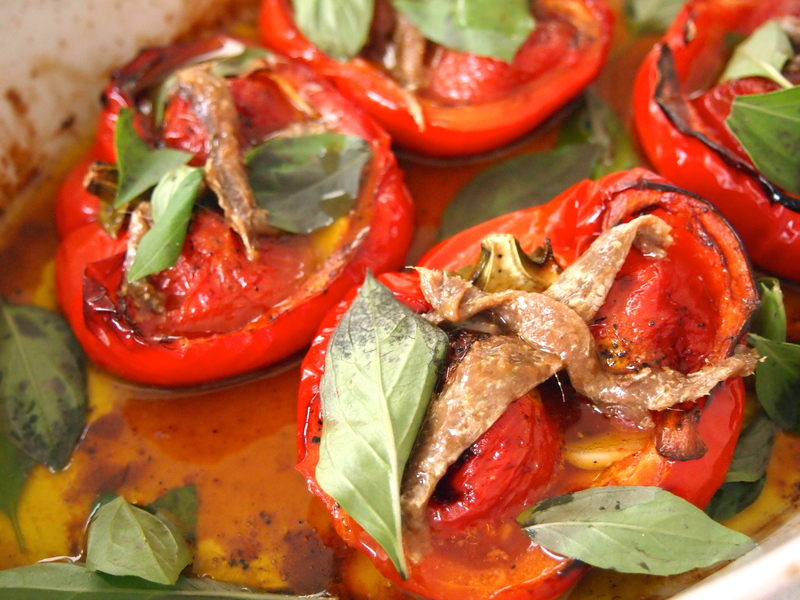 Criss-cross each pepper half with an anchovy, baste with the oily juices. Top with basil leaves and serve warm or at room temperature.